First things first: what are X-rays? They’re nothing more than electromagnetic waves, living on the spectrum between UV light and gamma radiation, or from about 30 petahertz to 30 exahertz. In principle, X-rays are easy to produce – all you really need is a roll of sticky tape and a vacuum chamber. That’s a trivial example, though, and relies on triboluminescence rather than through the interaction of high-energy electrons with dense metals, which is how medical X-rays are produced. Still, the principle is simple – just produce some electrons from a hot cathode and accelerate them into a target anode using high voltage. In practice, however, it’s not that easy. 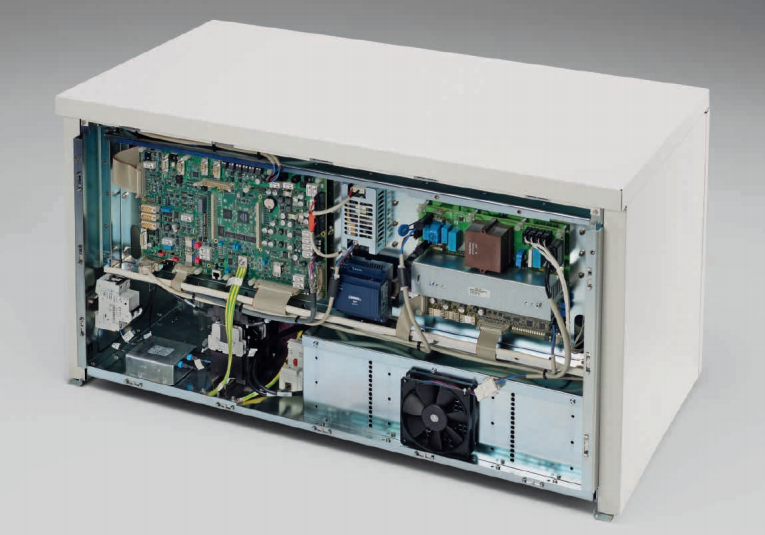 While some vacuum tubes can produce X-rays incidental to their main function – the high-voltage rectifiers in old tube-type TV chassis were notorious for this – making an X-ray tube is a tricky business. Even a simple fixed-anode DIY X-ray tube requires a fair amount of skill and some specialized equipment to build, and a reliable, long-lived tube for medical X-rays is a huge engineering step beyond that. The main problems that medical X-ray tubes – which are essentially particle accelerators – have to deal with all come from the huge energies needed to produce useful amounts of radiation. Thermal considerations are important. First, the cathode has to get hot enough to boil off electrons, which is in the 800° to 1,000°C range. And the voltage between the anode and cathode can easily exceed 100 kV; the kinetic energy of those electrons slamming into the anode can cause it to heat up to 2,500°C at the focal point. Handling anode heating is a problem that the rotating anode tube was designed to handle. Rather than a fixed target that gets blasted by electrons repeatedly, the rotating anode tube has a disc-shaped tungsten alloy target attached to a rotating shaft. When the technician says, “Deep breath in and hold it,” and you hear a motor start turning, that’s the anode spinning up to around 10,000 RPM. The focal spot of the electron beam is still only a couple of millimeters square, but the fact that a new anode surface is rotating under that beam while it’s on spreads the thermal load out over a greater area. Simple to say, but harder to engineer. The anode needs to be inside the vacuum tube, but the motor can’t be. That means the anode is attached to a rotor and bearings inside the tube, with the stator windings outside the tube. Bearings that can work in a vacuum under the kinds of heat loads experienced in a vacuum tube and can reliably conduct 100 kV or more are some kind of special. In some new tubes, standard ball bearings have been replaced with fluid-dynamic bearings using a thin film of a gallium-indium alloy that can conduct a couple of kilowatts of heat away from the anode. The cathode is a pretty amazing piece of engineering too. More like the electron gun of a CRT than the filament of an audio amplifier tube, the cathode of an X-ray tube shapes and directs the beam toward the target. Tungsten filaments sit in a focusing cup that electrostatically forms the beam. Most tubes have a dual-filament cathode; the technician can select the smaller cathode for a smaller focal spot on the anode and a tighter beam that will image small structures better. Specialized exams like mammography often use tubes with a filament as small as 0.3 mm, as well as an anode made of molybdenum to get a “softer” beam that’s better at visualizing delicate structures. While electrostatic focusing of the electron beam is pretty simple and proven, newer tubes are turning to magnetic focusing. These designs have a flat filament rather than a cup, and the beam is shaped using magnetic quadrupoles, making these X-ray tubes even more like a particle accelerator. So what powers all this? What kind of electronics live behind those putty-gray cabinets in the radiology suite? In radiology parlance, those cabinets collectively are referred to as the generator, the job of which is to provide all the power and control for the entire X-ray suite. Obviously that means providing the current for the filaments as well as the high-voltage field to accelerate the electrons. But there’s a lot else to run in the tube – the stator windings for the rotating anode, and possibly the signals needed for magnetic focusing. There’s also the power needed to operate the physical support for the tube, the patient table controls, the operator console, and just about everything in the suite. In the old days, the generator was a pretty simple circuit. 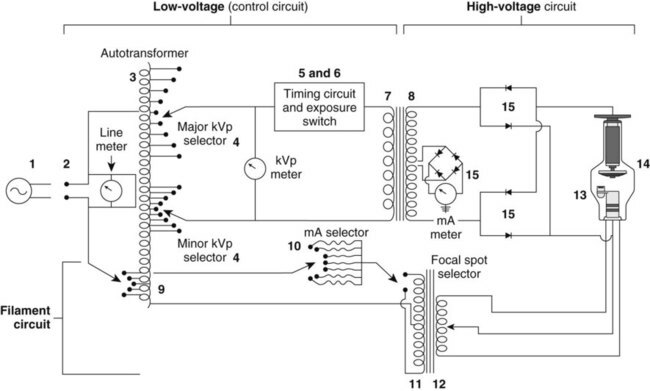 It basically consisted of an autotransformer feeding a step-up transformer and rectifier for the anode high-voltage, and a low-voltage section to power the cathode. Timing circuitry controlled the length of exposure, and a simple console was provided for the technologist. Now, generators are extremely sophisticated devices with embedded computers that talk Ethernet and CAN bus. Sleek touch-screen user interfaces are more likely than the old knobs and switches, and special features like automatic exposure control are built right in. But at its heart, the generator’s job is still the same – to heat the cathode and accelerate the electrons. Even though the engineering has come a long way and the control electronics have changed, an X-ray tube in service today looks pretty much the same as the tubes I learned about 30 years ago when I was in the field. That’s pretty much due to the physics being the physics, and although there are other ways to produce medical X-rays, like Thomson scattering using terawatt lasers or undulators where electrons wiggle through alternating magnetic fields and shed energy in the form of collimated X-rays, the standard X-ray vacuum tube and generator are by far the most practical way we’ll have to deliver medical X-rays for quite some time to come. Why can’t the motor be in the vacuum tube? Couldn’t you just place a squirrel cage or something inside the tube? How do you expect a squirrel to rotate the anode if it is inside a glass tube without air, water, or food? Just give the squirrel a miniaturized self contained breathing apparatus or a scuba re-breather vest. But feeding him and feeces elimination will still have to be engineered into the tube itself. Easier to dissipate heat when not inside the vacuum environment of a tube. The rotor has to be inside the tube for obvious reasons. It could be something as simple as a permanent magnet (that can can handle the heat, etc…) and suitable bearings. Either the insulation stability in hard vacuum or the heat dissipation problem are both significant enough to be showstoppers against putting the stator winding in the vacuum envelope. Another is that the anode is sitting at (typically) 40-70 kV, while the stator is at ordinary line potential, but in close proximity to the stator. Vacuum or not, that’s asking a lot of the winding insulation. And the stator is just a simple induction motor (squirrel cage) armature. No permanent magnet needed. Magnetic fields and electrons are not a good combination. The magnetic field from the motor would spray the electrons all over the place, making focusing of the beam very difficult. It is much easier to have the motor outside. I guess magnetically coupling is out of the question due to targeting issues. Maybe do it backwards and spin the electron beam. Turn the problem into the solution, magnetise the disc and effectively create a virtual homopolar motor, with the plasma spinning around instead of the disc. If you need it to stay still, just spin the entire tube at the same rate or use an external wave guide/sheet of millimeter conductors to act as a microwave lens. Your posting is an example of “how to make something exceptionally complicated”. And yes, the focal point has to be stationary to give a useful image. And your guess is obviously wrong, as “magnetically coupling” through the glaas wall in the form of the rotating field of an induction motor is exactly the way it is done. Why would you even want it in the tube? Most small pumps for home heating are built in a similar manner, except the rotor is separated from the stator by a thin sheet of stainless steel. Brings back memories of my days as a biomed tech. I recall the most wonderful method of checking the timers on the single-phase machines. There was a little brass top-looking thing that you would spin, then take the exposure. Since a 60-cycle machine would produce 120 pulses/second, a 1/10 sec exposure would produce 12 little dots on the film. Totally worthless if you had a newer (that give you an idea of the timeframe!) three-phase machines. Do… does the top thing have a specific name? It sounds like a rather fun way to measure machine speed, and I admit I love slightly out of the ordinary things like that and reed tachometers and such. I tried to find the device on Google but vintage radiographs of calibration procedures are near impossible to find. Side note: I’m never looking for medical x rays ever again. True nightmare fuel. I spent 5 years studying to become a medical physicist only to make same discovery as you. Luckily, there were other options open to you when you had a lot of knowledge of physics, radiation protection and an interest in electronics and computers. Does no one else feel bad for the cat? I can neither feel bad or good about the cat. I feel both ways… until someone asks me. Now, step all that up a notch or two for a current clinical computed tomography scanner: All that stuff has to live on a rotating platform: The tube with rotating anode, its power supply, cooling system, plus the 100 kW 150 kV generator (and a whole bunch of other stuff too). And you have to get that 100+ kilowatts of 3-phase power onto that rotating platform through some very nice sliprings (thank you Schleifring! ), plus control and safety interlocks. Data comes off on another (non-contact) ring at 10-40 Gbits/second in real time. Where does that 100 kW go? I wonder what percentage goes up in heat in the device versus coming out in X-rays? Rounded to the nearest percent, the fraction of energy coming out as X rays is zero :-) Essentially all the electrical power going into the tube must be removed by the cooling system (air in the case of a 2-D “plain film” type of system, liquid cooling in CT, C-arm, and other higher performance systems). Roughly speaking, a CT scan will put 100 kJ of electrical energy into the tube, and produce roughly 100 mJ of X rays getting out the collimator toward the patient. A chest or peripheral plain film might get a bit better utilization, using maybe 1 kJ to produce roughly 10 mJ of x-ray photons. There are liquid-cooled anodes, particularly in non-destructive testing and other fields. Maybe someone more current than me can comment on their penetration into the diagnostic medical field. 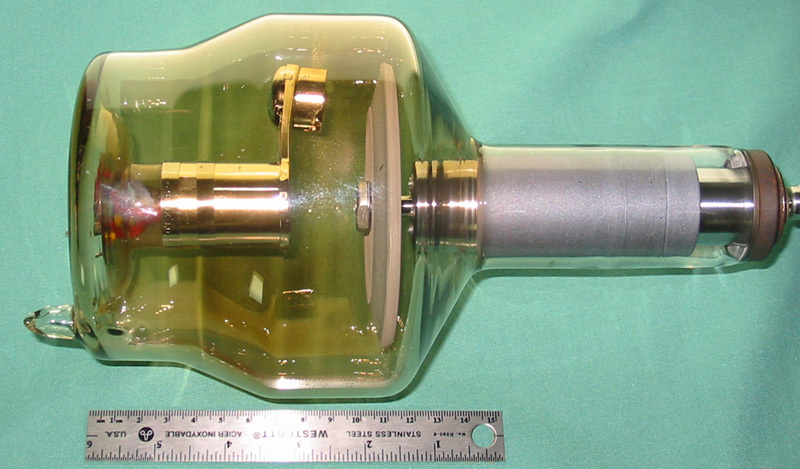 Siemens released a tube with a liquid cooled anode several years ago. Model designation is Stratton. Several different models are now available. MSRP for these tubes run $200,000 to $250,000 (!). How does the device remove the nearly 100kW of heat without cooking everything WHILE rotating at that speed? The average power is much lower (at most a few kW). The bulk of the energy during such a high power exposure is absorbed in the anode focal track, and then the entire anode itself, which can safely absorb megajoules. That gets radiated out through the tube wall over the course of a few minutes. For perspective: a car engine powering a car roaring onto a highway onramp throws off around 200 kW of heat, but the average power while cruising is about a tenth of that. The radiator & exhaust system need only be sized for the average power it must handle. He likes fresh air, so he leaves the windows open. Ok here’s a simple question, if we can take photographs at 10000th of a second why do I have to hold my breath during an x-ray? Also, inflating your lungs gets better contrast in the image between the lung and the stuff they’re looking for. Also a few other details. The actual exposure time is slow, but you have to accommodate the reaction time to push the button, the motor’s spin up time, and another detail no one has mentioned, the anti-scatter grid, which also has a motor and takes some time. I don’t know about the latest and greatest, but the ones I’ve encountered seem to take a bit under one second to get all the details together. The actual exposure is a tiny fraction of that. The command to take a deep breath and hold still gives a couple of seconds at least for the radiologist to do their thing. Ok, thanks, that makes sense. I was wondering why a heat pipe couldn’t be used to move all the calories out of the x-ray cathode. I suppose because it’s a huge temperature on a tiny spot, but low amount of energy overall. Heat pipes are better for larger areas. Just moving the thing out of the way makes more sense. 2) You didn’t mention the revolution digital sensing has been interns of minimising dosage and using alternate sources (read; nuclear medicine, gamma cameras). Given I can use a single plate to scan umpteen different patients, with each exposure being sent wirelessly to the cart and then to the computers, with a flat, A3 size panel CCD device doing all of this is absolutely amazing coming from someone just old enough to remember manually back-projecting CT scanstrips. Plastic scintillators, high-resolution wireless digital plates, low-noise CCDs, all make modern radiography safer, faster and more accurate than ever before. Also, I loved my Aquillon One at a previous job with 320/640 scanlines and the ability to do a full volume in .2 of a second, winding GB/s over a proprietary blinkenlight bus in the ring (literally, a whole ring of LEDs being read at once while spinning at 200+ RPM. Wide volume size gave me less motion artefact, no patient travel meant less overscan radiation exposure, high sensitivity meant lower doses. These machines are an absolute beauty to behold. They also break down, a lot! I was X-rayed a little while ago (and also MRI scanned before that), I was impressed, and curious, about the plastic plate they use instead of film. Was new to me. I wanted to concentrate on X-ray generation for the first article in this series. If there’s interest in a part two, I’ll make it about the detection end. That’s honestly where all the advances have been made since I was slinging X-rays back in the 80s. Thomas F: you clearly misinterpreted what MiniMAX is. It isn’t about the xray source at ALL. It’s a cheap way to make a (rather poor) x-ray detector replacement for film: it is just an alternate method to read out a standard phosphor plate detector that uses a digital camera instead of a flying-spot readout. It make no claim whatsoever about the x-ray source — it just uses whatever is normally used. The original paper used a rather ordinary pulsed industrial source: 30 year-old technology (invented in Ann Arbor, MI!). LOL schrodinger’s cat I see what you did there.